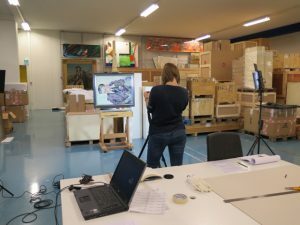 I became involved in the De Ploeg Conservation Project through contact with Marjan de Visser, a painting conservator based in Den Haag who correlated with Groninger Museum for this extensive project. I am currently studying for a BA (Hons) in Art Conservation at City and Guilds of London Art School in the UK, and relished the opportunity to be involved in part of this. It not only provided an insight into the process of conserving such a large collection of paintings, but also provided the opportunity to work in an overseas environment and immerse myself in a new team. 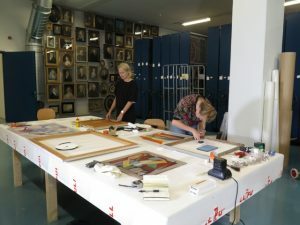 The De Ploeg Conservation Project aimed to assess and conserve over three hundred of the Groninger Museum’s collection of De Ploeg paintings; a movement most prominent during the early 20th century. ‘De Ploeg’ consisted of Groningen-based artists whose works were heavily influenced by the Expressionist, Constructivist and Impressionist movements, and was driven by a desire to create more opportunities to exhibit their work. 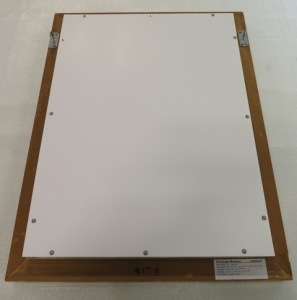 Our team was brought in to photograph, assess the condition, dry clean, apply cushioning to the rebate of the frames, and apply new backings to the paintings to stabilise slack canvases. Where necessary on more damaged and degraded paintings, Marjan de Visser and her colleague Susan Smelt would consolidate vulnerable paint layers, and fill and retouch losses. before and after the foam-core backing was applied to the painting). The team working on this project consisted of six conservators and interns, fronted by Marjan de Visser, and painting conservator Susan Smelt. 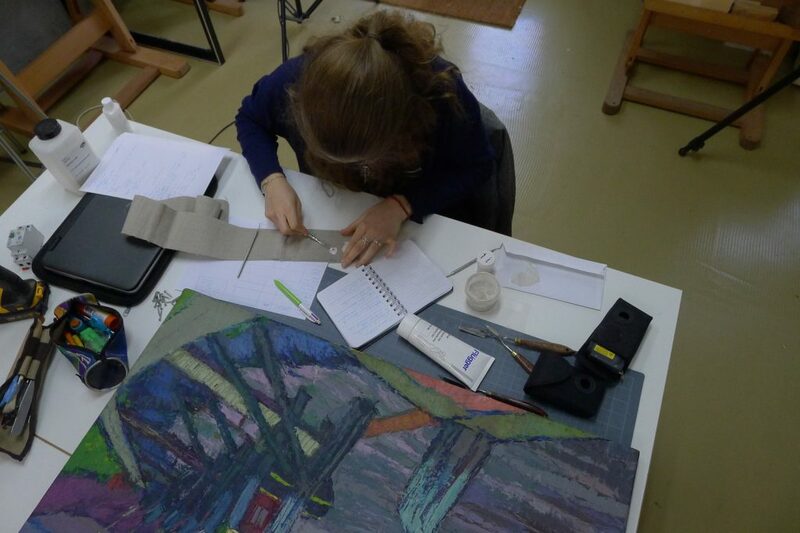 The interns involved for these two weeks were Sjoukje van der Laan and Marleen Wagenaar, both completing their Masters in the Conservation of Modern Art at the University of Amsterdam, Celine de Ruiter who is currently studying Restoration and Decoration at Cibap, and myself. Our varying levels of experience were a positive component of the project, as each one of us was able to suggest and implement different ideas to aid the process. As the project will continue throughout 2014 and 2015, this was particularly relevant at such an early stage, as the method was still evolving. 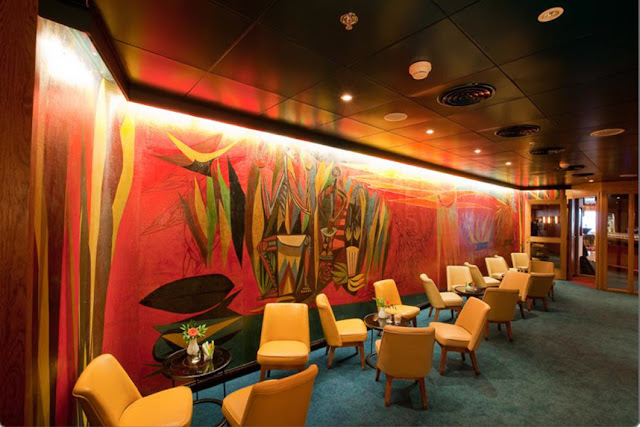 Prior to the beginning of the project, a rating system of treatment for each painting was established, allowing us to achieve continuity in the work we were carrying out. The rating each painting was given, either A, B, C or D, clearly outlined whether it needed excessive conservation and restoration in a studio environment, or whether it was in a stable enough condition that a general preventative conservation treatment would suffice. While working on such a large collection, it quickly became clear how important it was to create and maintain a working system to make the best use of our studio and keep track of the many paintings circulating the space, and what work had been done on them. In many situations this opened up a good dialogue on the most efficient way to treat the paintings, for example whether the panel paintings required the same foam-core backings that were applied to canvas paintings, to supply further protection, or whether this was a superfluous addition. Often, I found the most fascinating part of the project to be the examination of the paintings. It was extremely gratifying to attempt to understand the artists’ intentions and processes simply by looking. For example, ascertaining whether the artist applied the ground themselves or whether it was pre-prepared by a factory, and whether the frame was original, re-used or new. Through thorough visual examination we were sometimes able to identify certain materials, such as the presence of a fugitive red lake pigment that had been preserved only underneath the rebate of the frame, but had faded due to light exposure on all uncovered areas. 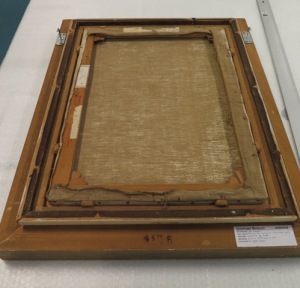 One particularly interesting case involved a maroeffle substrate, where a painted canvas had been adhered to a piece of wood that had not been cut down to size. This led to an interesting conversation with Marjan and Celine regarding the intention of the artist, regarding whether he had chosen this substrate or if this had been a subsequent decision later on. The discussion drew on evidence provided by the method of painting and the current state of the canvas, which allowed us to arrive at a theory. 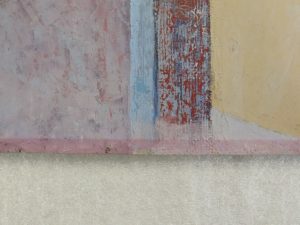 A technique that is unique to the De Ploeg movement is the experimentation of wax with oil paint, providing a more matt, level finish, without the definitive brush strokes of oil paint. Often, what appeared to be wax paint would be later discovered to be purely oil used in a particular way, or vice versa, which added an intrigue to the technique, and our way of identifying it. As this raised questions that were unable to be immediately answered, it provided a good discussion among our team. This project provided me with an excellent basis into further work in paintings conservation, through examination, techniques and materials. Although I was only part of it for two weeks, the project was already gaining momentum. This was highlighted by the interest of newspaper Dagblad van het Noorden, who published an article on the work being undertaken. The collection itself is an incredible selection of paintings to be able to understand and work on so closely, and I was thrilled to have the opportunity to be part of this project. Restoration by Lenka Argalasova of two 17th ‘s century Coats of arms of a Dutch family belonging to theCentraal Bureau voor Genealogie Den Haag. Discusion of the further restoration treatments with Rob van Drie, Bert Lever and Conrad Gietman from Centraal Bureau voor Genealogie.